I love 6, 7, and 10! May 21, 2011 What Happened at Damon Fowler's Graduation? It might be just me, but upon casual reading, #4 seems to be a tad antisemitic. Am I crazy or is it actually suggesting Jews spend all week cheating Gentiles? I thought the same thing…the rest are pretty funny though. Shells: Not just you. Both 4 and 8. Yeah, no religion was off limits back then. Freethinkers of the age didn’t see Jews as a race, but as a hypocritical religious sect, much like Catholicism, so being antisemitic was as common as being anti-Muslim is now. Case in point: drawing a certain Arab and labeling him a child molester. Racist? Or not? Irish Catholics were known for their drinking habits. Jews were known for their business practices. Average Christians were known for their drinking, gambling, and philandering. It wasn’t racism, it was just religious hostility. Upon reading 4 and 8, I could also see 10 being construed that way. Implying that Jews covet everything. I’m not sture I would read it that way if it weren’t for the antisemitism that came before it though. Gotta love number Nine. Thou shall not lie, except when dealing with infidels or benefiting the church. Remember children its okay to lie for jebus. Though, it would appear no one was being singled out, or left out, for that matter. Do you know who was the most offended by this cartoon? The Catholics. True story! With that said, can anyone say “Goldman Sachs” and not see this cartoon being drawn today? It’s not anti-semitic. Geez. It’s parody. The Big Ten were given to the Jews; that’s the humor. Yeah, the whole thing seems like a slam against Jews in particular as a people and a culture, not religion as a whole or even the Christian perception of the ten commandments. I think you accidentally found an anti-Semetic cartoon and mistook it for an anti-religious one. Crap people! This was a jewish set of commandments given to jews! 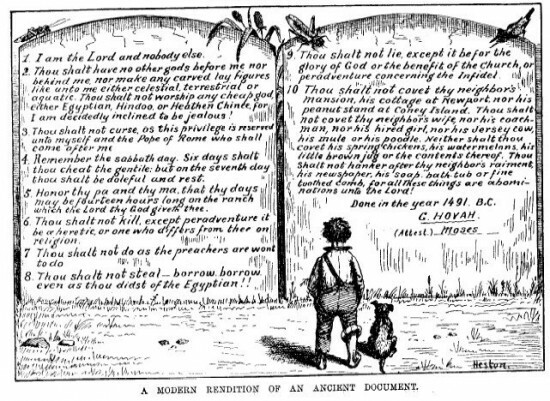 The artist simply kept it in form, likely to point out the fact to christians who seem to think, even today, that these are christian commandments. How is this anti-Semitic, at all? The only way this can be racist is if someone deliberately reads racial intent into it. And I mean, the commandments (and the Bible) actually do have hypocritical things like that in them. So it’s not like these criticisms are unfounded Calling this cartoon “racist” would be like saying that arresting a black guy for a robbery is “racist” because there is a racial stereotype about black guys being thugs and robbers. That may be (unfortunately) true, and that’s certainly not okay, but that doesn’t excuse people who *happen* to conform to a stereotype while doing something wrong, criminal or hypocritical. It’s like, you can do whatever you want, if your actions happen to coincide with a racial stereotype of some kind! Sweet; I’m a white guy, maybe I can go screw some ethnic minorities out of their civil rights! #4: Has the greatest likelihood of being anti-Semitic. However, it may be referencing the religion (not the people), especially the view of Gentiles in Talmudaic era Jewish religious writings and Jewish tradition. #8: Most likely attacking religious/Biblical hypocrisy, not Jews, especially as Jews are typified as predatory moneylenders (not borrowers) in anti-Semitism. #9: Makes specific reference to the Church. Unlikely to be anti-Semitic. #10: Just being satirical IMO. I think that it is primarily being anti-Religion and should be characterized as freethought, although #4 may indicate some anti-Semitism.